While most people think pole fitness is a sport only for women, they are wrong. The sport takes strength, endurance, and flexibility, and the men that participate in the sport have a flow about them that is often not seen anywhere else. And while we women have a hard enough time fighting the stigma of pole dancing, men have an even harder time–fighting both the general stigma of pole dancing, but also the stigma that it’s a “women’s only” sport. While it’s not as common to see a man pole dancing as it is to see a woman, the men in this sport DO exist. Many men start out by accompanying a girlfriend or wife to a pole function, recital or class and then end up trying out pole for themselves. Take a look at this tumblr blog for male pole dancers, for example–look at the muscles, the strength, and the flexibility these men possess. Some of these tricks and poses are incredibly advanced, and can take years to master. 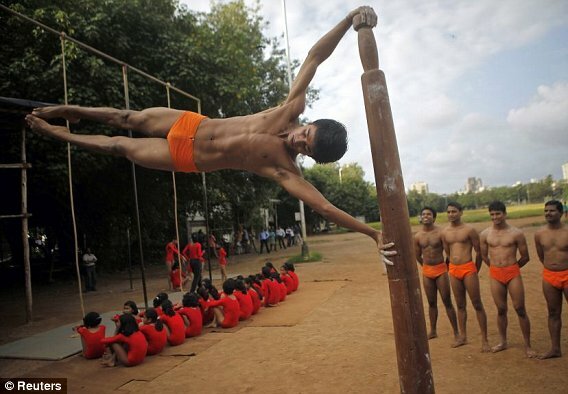 As I noted in my earlier blog post about the History of Pole Dancing, poles being used for exercise can be traced back to the traditional Indian sport of mallakhamb at least eight hundred years ago, which was traditionally performed by men. Additionally, Chinese pole, originating in India, uses two poles on which men would perform “gravity defying tricks” as they leap from pole to pole, at approximately twenty feet in the air. In October of 2011, men completed in the annual World Pole Dancing competition for the first time, as noted by this article. That was a few years ago, and men’s interest in the sport has continued to grow. The US National Pole Championships were held in New York August 1-3, and Seanmichael Rau took first place in the men’s division with his jaw-dropping performance which you can watch on You Tube here. Some women seem a bit hostile at the prospect of men joining a sport that has been seen as a women’s activity for years. But being in a sport that is still struggling to be accepted into mainstream, it seems to me we should accept with open arms anyone who is interested in participating. Men can help this sport gain traction, and can lend credibility to the strength and agility necessary to excel in it. At Inversions Pole Fitness, we’ve had men both join our Inversions class and take private lessons with me, and their upper body strength serves them well when learning tricks. Most men like to focus on controlled strength-based moves that focus on their natural physical advantage as a man. We’ve had men in the military, men in CrossFit, and men in golf take our classes, all walking away wanting more! Let’s embrace the interest these men show in our ever-growing sport, and have them help us take it to the next level! If you are a man interested in pole or know of any men interested in this growing sport, come by our 9am Inversions class on Saturday mornings, or call the studio at 843-460-0654 to register for a class or private lesson! 2016 Olympics, anyone?